Walter Edgar retired from the University of South Carolina in 2012, after a forty-year career. he currently hosts “Walter Edgar’s Journal" and “SOUTH CAROLINA FROM A TO Z” on SC ETV Radio. Among more than a dozen books that he has written or edited are South Carolina: A History and Partisans and Redcoats: The Southern Campaign that Turned the Tide of the American Revolution. He was also editor-in-chief of The South Carolina Encyclopedia. 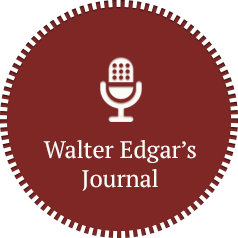 From books to barbecue, from current events to Colonial history, Walter Edgar's Journal delves into the arts, culture, history of South Carolina and the American South. View the Program Listings on SC ETV Radio. From the most entertaining and readable opus ever penned on the state- South Carolina: A History- to the comprehensive South Carolina Encyclopedia, Walter's rich narratives tell the stories of the South. From South Carolina to the nation and abroad, Walter's talks always draw crowds. Check the calendar to see when he'll be in your area or to inquire about Walter speaking at your next event. Copyright 2018, Walter B. Edgar. All rights reserved.